The "Accounts" icon from the left side command bar takes you to the corporate account membership functions for your company account. This will typically only list a single corporate account, unless you as a company administrator have multiple corporate accounts. Members of your account will be listed on the corporate account card. Clicking on the image avatar will list the registered details such as name, email, mobile phone number etc. If you have administrator privileges you can make changes such as adding/removing users, setting up meta data types, default connection types, asset costs, etc. to the corporate account. To do so, simply click on the Settings icon in the lower right hand corner on the account card. Here you can change the corporate account name by editing the "Name" field, and change the company logo by selecting a new image under the Avatar section. Developer Note! The API also supports the “vendorAttributes” attribute for assigning unique identifier. If you would rather employ this for auto inheritance, then you can specify this here under the “General Tab”. 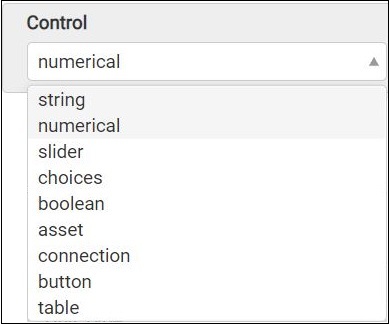 If you have programmatically defined “vendorAttributes” it will show up in the drop-down list, and you select it here to override the default setting of “vendorid”. This is new from version 1.4 of the API. This section allow you to assign account based default costs for all the assets in the generic Asset Library. Note! This is different from the project based asset cost settings as described in the Dashboard section of this documentation. If you set up the costs on the account level these cost will be used as default for all new projects created. You can revert any changes to the default account values by pressing the Reset to Default button. To save your changes, scroll up to the top of the page and press the "Save changes" button. 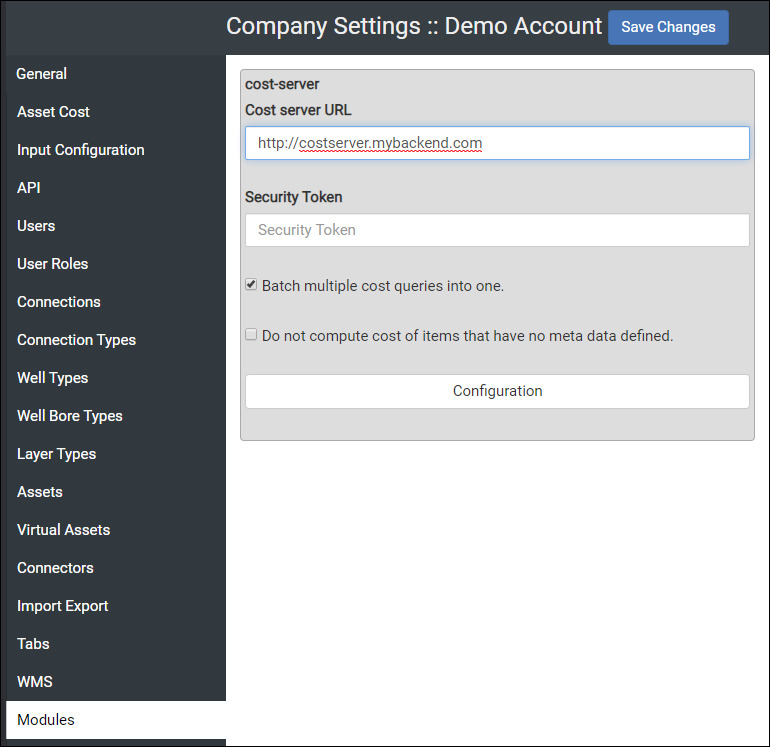 This section allow you to assign account based default costs for all the defined Connections defined for the account. 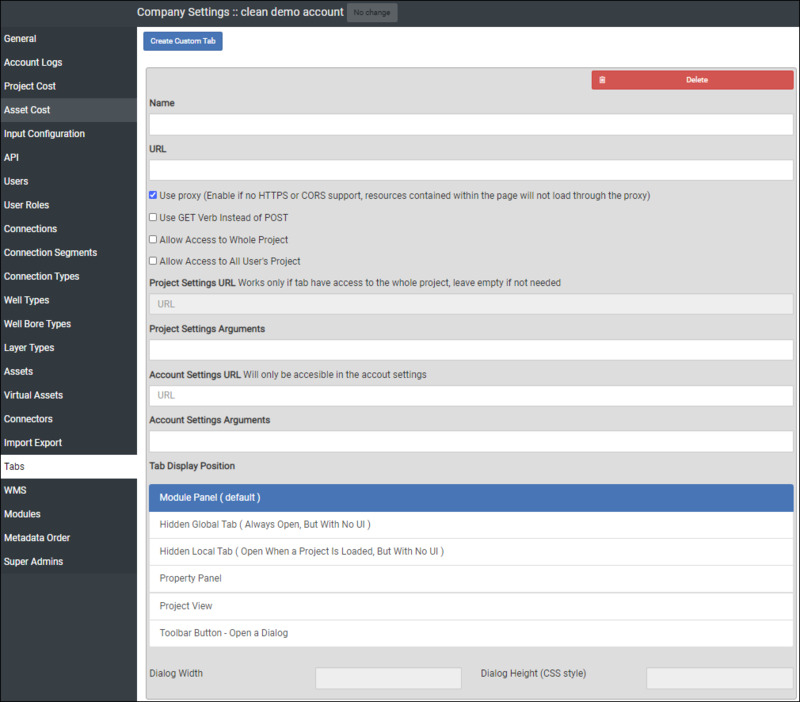 This is different from the project based connection cost settings as described in the Dashboard section of this documentation. If you set up the connection costs on the account level these cost will be used as default for all new projects created. To set a cost, simply enter the cost value in the appropriate Price entry field for the desiered connection e.g. Umbilical and also select the corresponding Currency. These settings are optional, and are typically used by our EPC customers for additional information about the project. As a system administrator you can define a list of Regions and/or Customers here. By clicking on the Add button you can enter the Region or Customer name respectivly. The entries you add to the Regions/Customer lists will then be available for selection in the Project Settings screen for selection when users create new projects. You can delete entries by selecting an entry in the corresponding list and clicking the Remove button. In the Project Settings screen, you have the option to specify a Country entry for the project by selecting from a drop-down list of available countries. 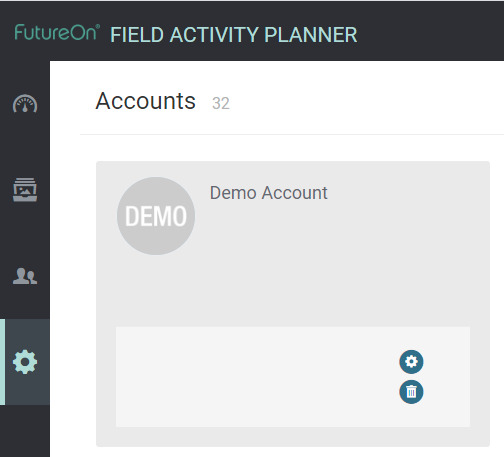 Use the Create API Token button to create a unique API token for your account that must be used for communicating with the Field Activity Planner REST API for integration and/or development work. Use the Copy button to copy the key to the clipboard. If you wish to revoke the current token, simply click on the Revoke button. Under the Users setting tab you as an administrator can invite new users. You can add as many as you like as the license agreement will be limited by the number of concurrent licenses you have. Now simply enter the email address of the person you wish to invite, choose the system role (user or administrator) and press "Send invite" to issue the invitation. Otherwise select "Cancel" to return without inviting anyone. When the new user accepts the invitation by clicking the link in the invitation email the user needs to fill in some user information. Note! The Phone field must be filled in with the users mobile phone number as the Field Activity Planner uses token based authentication as a security measure over SMS/Email, unless your account is set up for corporate SSO authentication. The mobile phone number must also be prefixed with the country code at present. The other fields are not required. To change the user role between Admin and User simply click on the User role button in front of the name and it will toggle the user role. You can also Remove a user by clicking on the corresponding button located on the far right side. This will display a dialog prompting you to verify the operation. To control the granularity of user module and data access, you can select or deslect the follwoing options; Cost, Meta Data, Layer, and Well. A checked box means that the user will have access to these modules and/or data. A user will be listed as pending until they click on the invite link in the email and save their user details. You can delete pending invitations, and issue a new one if you wish. 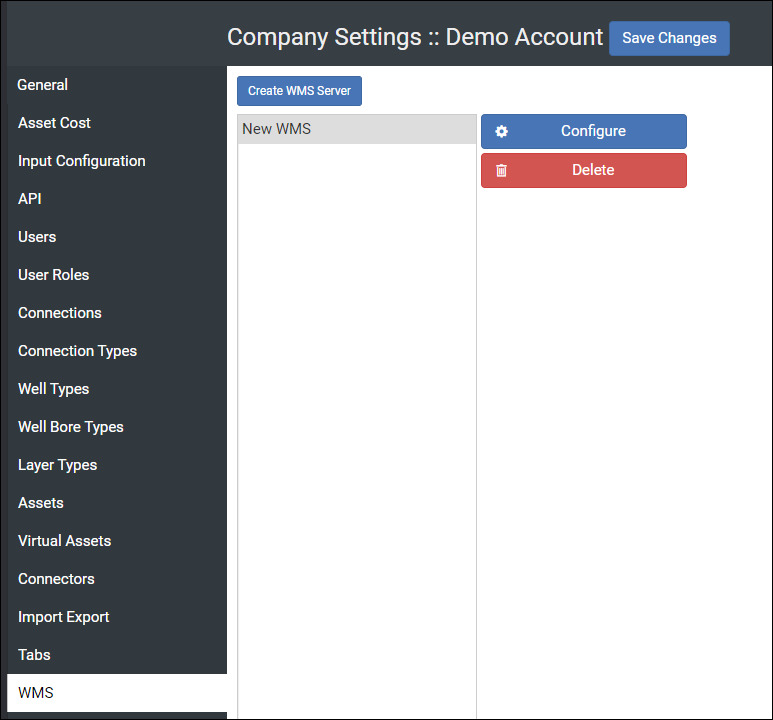 This allows you to modify or create new default connection types for any new projects created for your corporate account. 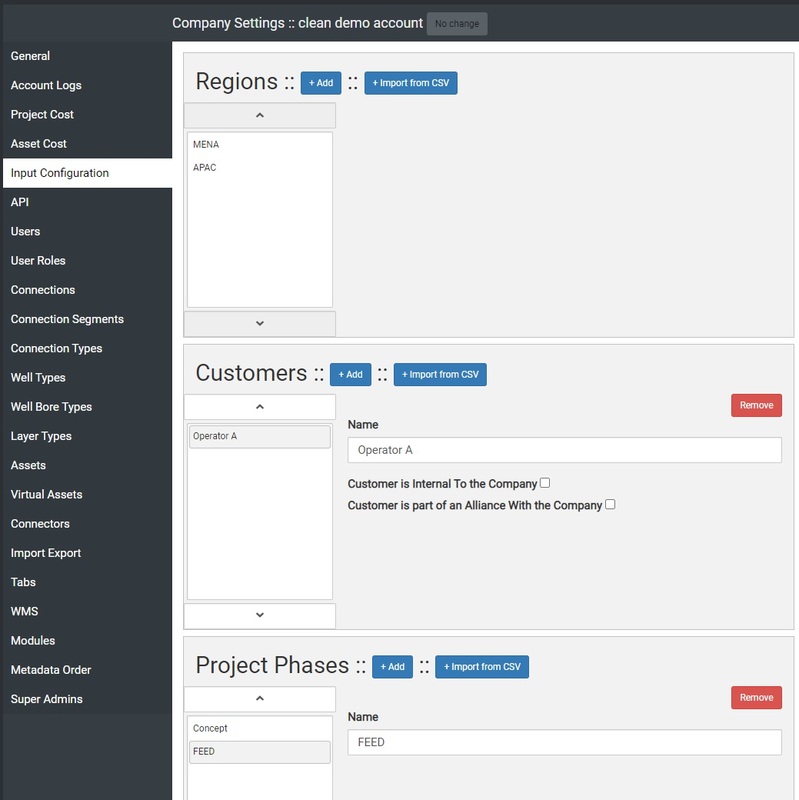 All users can also add project specific connection types on a per project basis afterwards. To modify an existing connection, you can change the connection Name, Category, Symbol, Color and Style properties. 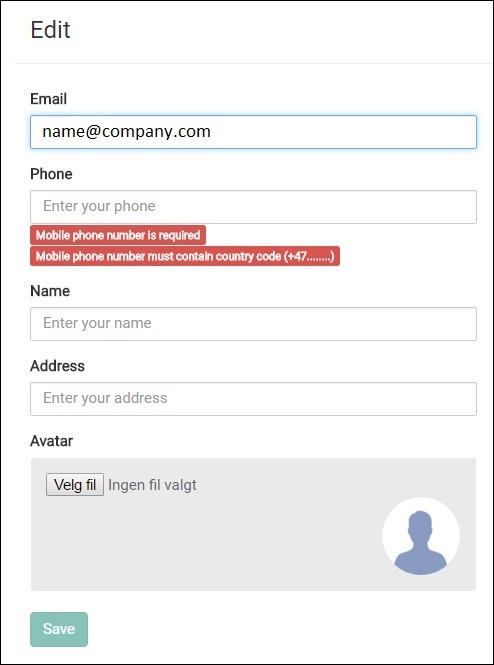 You can Add a new default connection type by clicking on the Add New Connection button and filling in the Name, Category, Symbol, Color and Style fields. Name - Type the name of your connection type. Category - Select the category of your connection e.g. Umbilical, Production, Water Injection, etc. Symbol - Type in the symbol designation for the connection e.g GI for gas injection. Color - Use the color picker dialog to select a new color for your connection. Style - Use the slider to select the drawing (line) thickness of your connection, and if you want a dashed line style then click on the dashed icon. Add Meta Data - See the Meta data section for more information. You can delete an existing default connection by clicking on the Remove button on the right side. This tab allows you to define “Connection Types” or connection systems if you will. By default, the following connection types or systems are defined: “Riser – Lazy Wave”, “Jumper – Horizontal Z”, “Jumper – Vertical M”, and “Jumper – Vertical N”. The default types also have a predefined “Render As” option e.g. how the connection will be represented graphically on stage. To create a new Connection Type press the Add New Connection Type button. Then give it a name and assign how it should be rendered on stage by selecting from the Render As drop down list. Standard is the default render type e.g. rendered as a classical connection. To delete a connection type, press the Delete button. By creating a new Connection Type or system you can then use it to discriminate metadata when creating new meta data types for “Connections”. See the Meta data section for more information. This section only allows you to add/remove and/or modify Meta data for your assets. See the Meta data section for more information. Virtual assets are non-visual metadata descriptions/objects that can be linked to other assets, connections, and connectors. 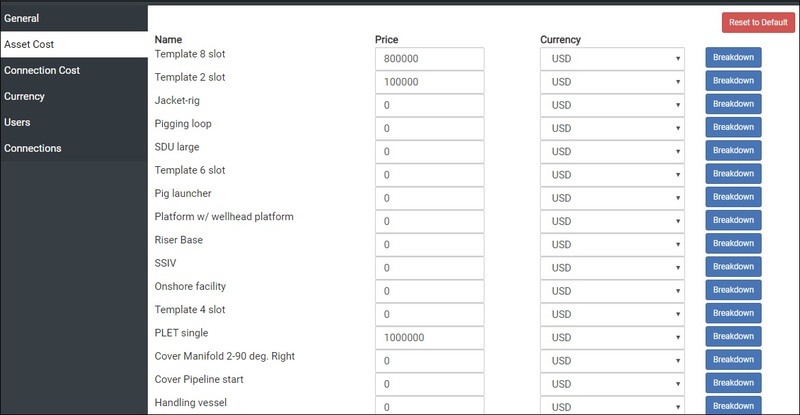 Examples here could be the creation of virtual fluid assets that can be assigned to pipelines for running simulations, non-visible topside equipment such as pumps that needs to be assigned a cost and appear in bill of materials etc. To create a new virtual asset, you need to select the "Virtual Asset" tab as shown above. Name is the name of the virtual asset you want to create. 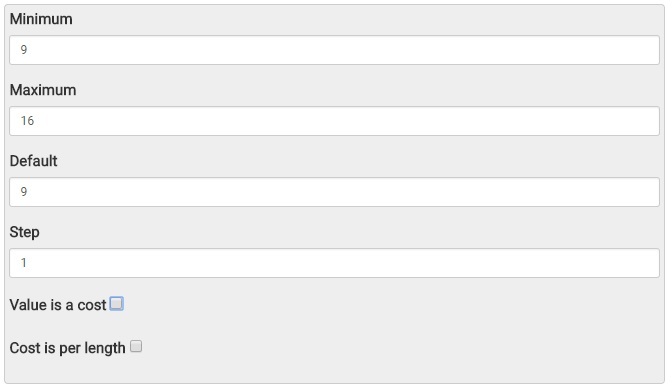 The Sub type drop down list allows you to assign a type to it e.g. SPS, piping, rig, vessel etc. And Category assign it as e.g. Manifold, Template, XMT etc. The meta data creation for virtual assets works the same way as for all other assets. See the Meta data section for more information. And the creation, and population of the virtual assets can also be done programmatically by using our REST API. This section allows you to create new Connector types to your account, and you can also create/edit/delete Meta data for them. Name - Specify or edit the name for the new connector. 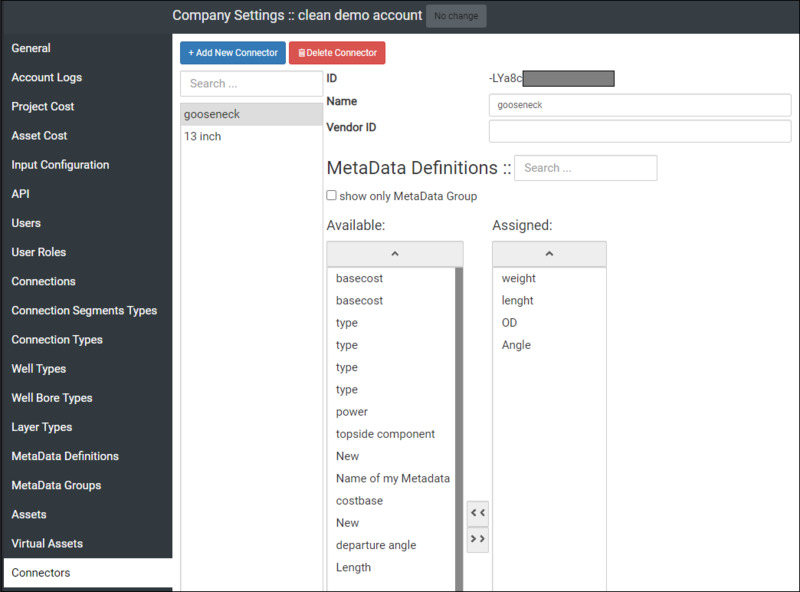 Remove - The Remove button will delete the selected connector entry from the list and all associated Meta data. You can now in the “Account Settings” in the “Assets” tab edit connectors directly, by selecting an asset from the available assets list and pressing the “Edit connector” button. Use the zoom/pan functionality to navigate to the desire “Socket Connector” and select it by clicking it. You can then change the “Type” of connector value and also set the “Orientation” to either “Horizontal” or “Vertical” for each socket. Press the “Update” button to make the change effective. The “Reset” button will reset the settings to the original defaults. This section allows you to create custom tabs, that will display an embedded iFrame or web page if you will as a seperate Module tab. This is useful if you want to display result pages from invoked simulations using the API or embed business dashboards such as PowerBI or similar etc. Name - This will be the name displayed for the module. URL - This is the URL for the web page that will be embedded and displayed. Note! Only HTTPS connections are allowed. Use proxy - Enable this if the resource you are loading does not have HTTPS or CORS enabled. Always alive - Enable this to keep the tab active even when there is no focus on it. Here you can preconfigure the setup of different external/internal WMS servers (Mapping servers such as ArcGis) for your users so when they create new projects they do not have to configure it first. Click on the Create WMS server button to get started. Name - Type in a descriptive name for your users e.g. North Sea ArcGis. URL - Enter the WMS service URL in the Server field. Use proxy - Depending on your network settings, or if you want to access a non HTTPS WMS you will have to check the use proxy selection. SRS - After you have input the WMS service URL, and have the correct proxy setting this drop down list will display the available coordinate system choices for you to select. Format - Allows you to select from a list of the image formats that can be returned from the WMS server. Finally FieldAP will query and display the various configuration options returned by the WMS GetCapabilities call below the Format list as shown below. These you can then configure as you see fit. Please see the WMS map service documentation for more information. Press the Save changes button at the top to store your configuration. 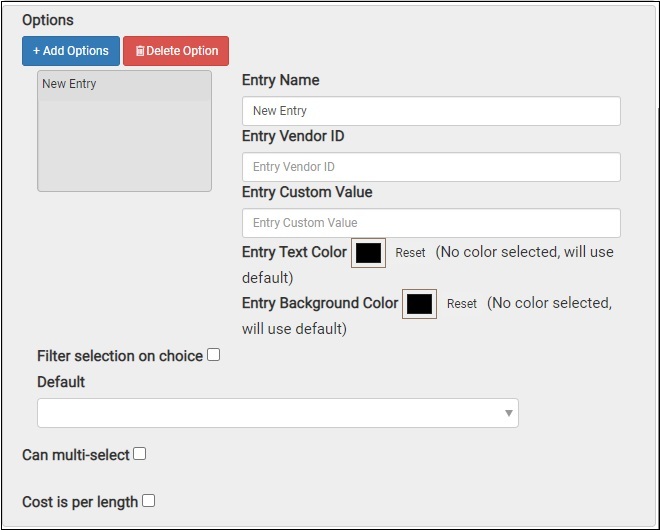 This section allows you to define various settings for external back end or 3rd party services. 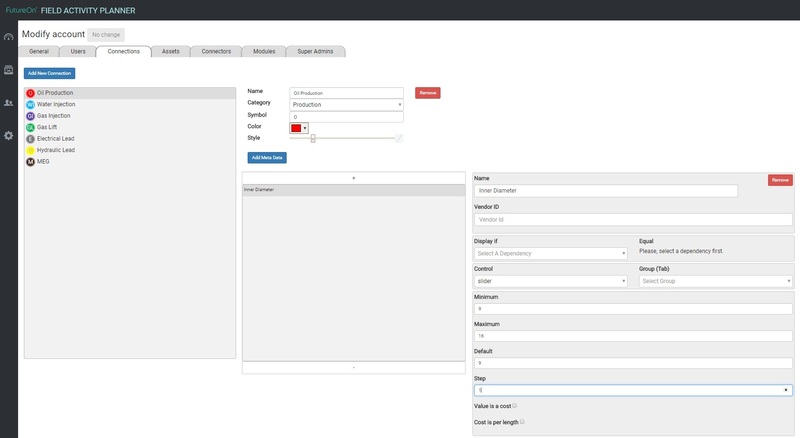 At the moment you will see the Cost-server configuration section displayed. The cost server configuration is used if you are integrating your own costing software with Field Activity Planner Cost Servcer interface so that you can invoke the Server button in the Cost modules for your own propritary cost calculation functionality. 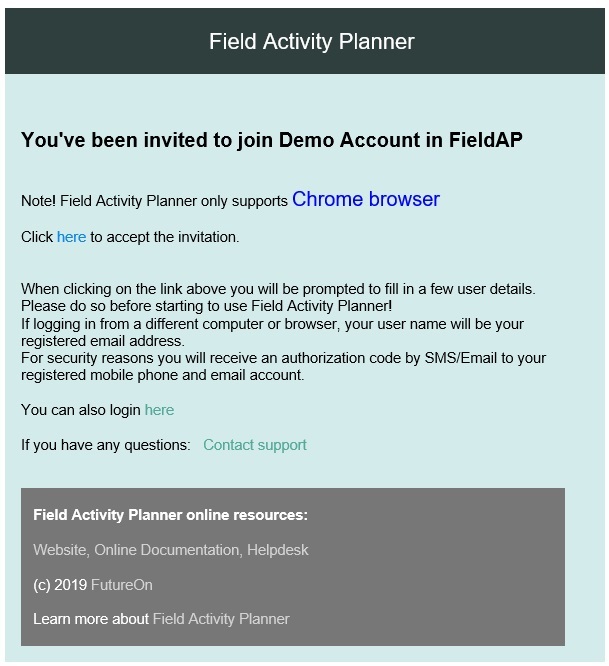 For more information and for documentation on the Cost Server interface, please contact your Field Activity Planner representative. Cost-server field - Enter the URL pointing to the location of the Cost Server interface. Security token - Enter the optional security token for cost calculation authentication. Batch multiple cost queries into one - Select this checkbox if you want to avoid sending individual requests for each cost item to be calculated by the server. By clicking the Connections, Assets or Connectors tabs in the top of the account settings page, you can add your own custom Meta Data Types. For all of these if you press the Add Meta Data button you will have to specify the name of you new meta data in the Name field. You can also assign an optional alphanumeric Vendor ID of your choosing. To remove the entry, click on the Remove button. As an example, in this picture we have clicked the Connection "Oil Production" and clicked Add Meta Data, named the Meta Data Type: "Inner Diameter", and selected the Data Type as "Slider". The available options for the slider is a minimum, maximum and a default value. The step value is how much the value changes when you slide the slider button. 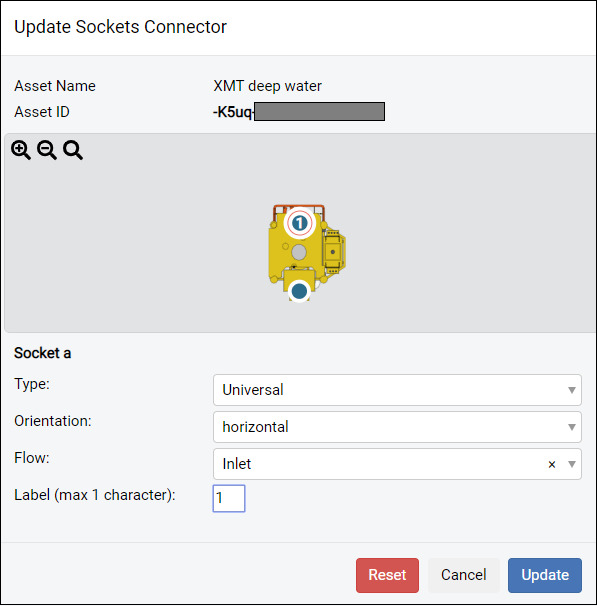 You can add as many Meta Data Types you want for the different Connections, Assets ,Connectors and Virtual Assets. The Data Types available are as follows: String, Numerical, Slider, Choices, Boolean, Asset, and Button. Numerical is a numerical input field where you define a Minimum, Maximum, and a Default numerical value. You can define the Units to be used for the field. 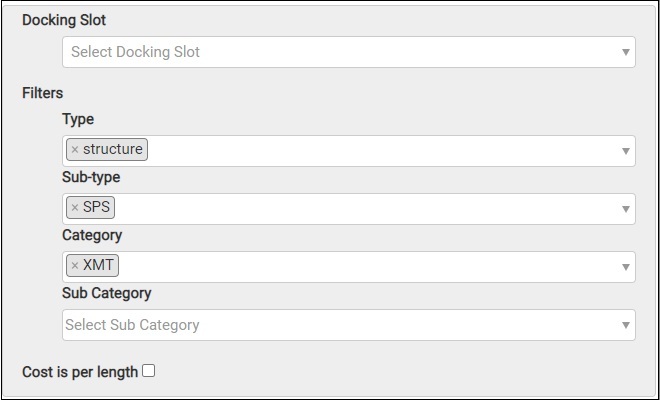 Select a Unit category first and then the available Unit type selections available will vary based on the category selected. You can also check the the Value is a cost option so it will get computed in the cost equipment module. You can also define the numerical field to be read only by checking the Value is read-only option. And lastly, if you add meta data for a Connection, you can also define the numerical value to be used in a cost per lenght calculation by selecting the "Cost is per length" option e.g. cost per meter of pipeline. Slider as explained above is a graphical slider that gets defined with a minimum, maximum value and the step value of the slider You can also check the the Value is a cost option so it will get computed in the cost equipment module. And you can define the numerical value to be used in a cost per lenght calculation by selecting the "Cost is per length" option. Choices is a list of choices you define (alphanumeric or numberical) that can have a cost value attached to each element thats get computed in the cost equipment module. The Default drop down list allows you to specify the default selection. You can allow for multiple options to be selected if you check the "Can multi-select" option. 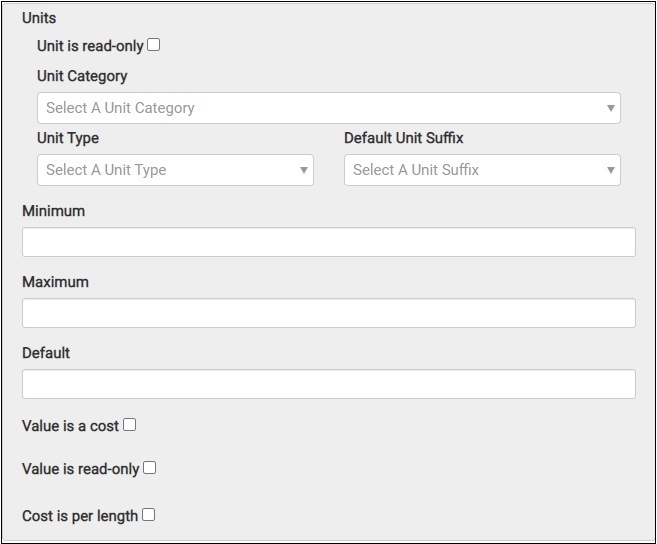 If you add meta data for a Connection, and it is an numerical value it can be used in a cost per lenght calculation by selecting the "Cost is per length" option. Boolean is a TRUE / FALSE checkbox with the possibility to have a "Cost per length" attached to it thats get computed in the cost equipment module. The Default checkbox indicates the default boolean state e.g. if checked the option is TRUE by default. Asset is a type that makes it possible for you to link another asset to your object. As an example you make a data type called slot 1 in a 4 slot template - you can then choose asset as data type, and in the project you link a xmt asset into the slot. 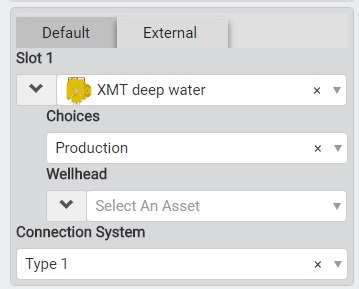 Then the metadata for the xmt will also show up in your meta data editor in the project and every asset linked will then be computed in the cost equipment module. The Asset data type also has a Filters section, where you can preselect the following filters; Category, Type, and Sub type to help narrow down end user selection when using the Meta data editor in a project. Button allows you to place a button with the text specified in the Caption field into the Meta data editor. You can then assign an URL in the Action URL field that typically invokes a call to an external service/server for launching a simulation, calculation, or some other operation with your own or 3rd party software. 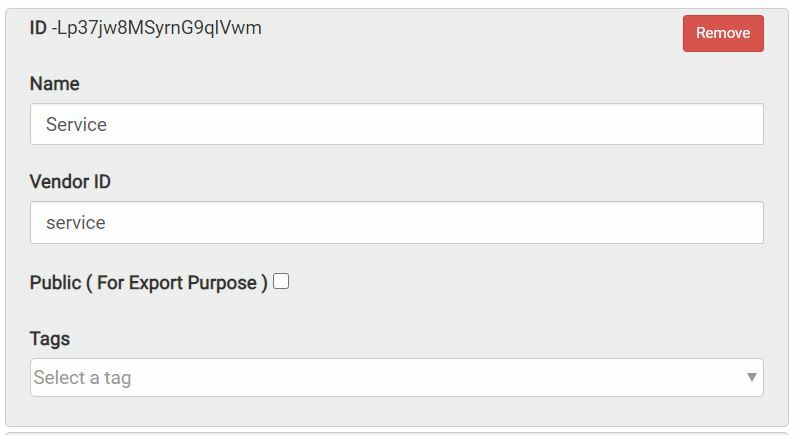 The Token input field allows you to designate an optional API key or other form of token value if needed by the server/service you plan to invoke. 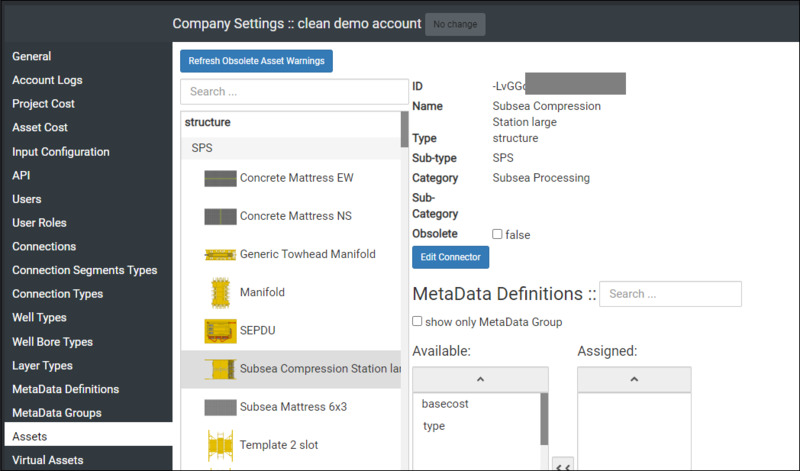 This section allows you to add logic to the meta data configuration combined with the Group (Tab) field. The Select a dependency drop down list will show all the metadata you have defined so you can select the one you want. Then select if the condition should be Equal or Not Equal to the values or options you have defined for the meta data. Use the Add a condition button again to create multiple conditions. As shown above you can have an conditional extra selection tab displayed for the user in the Meta data editor. To do this you specify conditions such as Display the Group tab (named external in this sample) if Slot 1 is equal to XMT. This will then show the following to the user.